Today was a sad day and a busy one. We had to work really hard to complete the packing, cleaning and preparation on the RV before taking it about 10 miles down the road to Motor Home Specialist www.mhsrv.com in Alvarado. We should have been off the RV Ranch campground www.rv-ranch.com by 12:00 but overshot, just as we did last time by an hour or so, but as always they were very helpful and supportive to the extent that they turn a blind eye to the number of trips we make to fill their dumpster up, and even washing the vehicle down. On leaving the campground we put another 10 gallons of fuel in the tank to take it to just over half a tank which is a requirement should we put it up for sale by consignment, presumably to ensure there’s sufficient fuel for test drives by potential buyers. The drive to Alvarado was a very sad one for us. On arrival at MHS I drove to the workshops to arrange for a few minor repairs to be done on the vehicle. I then drove back to the main building to drop off Rosina and all of our luggage before running back down to the workshop area (this is a big complex) to park the RV for the last time. I took some photographs of the interior to remind us of what she looked like. I found myself talking to her, thanking her for looking after us so well. She’s been ours for nearly 18 months and our home for 6 months in all kinds of weather from ice and snow, through near-hurricane winds and rain to scorching dry heat in deserts, and been our mode of transport for some 15,500 miles. That’s a lot of miles on a lot of different kinds of roads and she’s never let us down, never missed a beat, and done everything required of her. I'm glad now we're not shipping her to Europe. She's a big vehicle with a big engine and designed to travel the wide open spaces of America. This is where she's meant to be, this is where she belongs. I sincerely hope that her next owners will love her as much as us. There were a few tears shed as we said goodbye, she had help make our dreams come true. 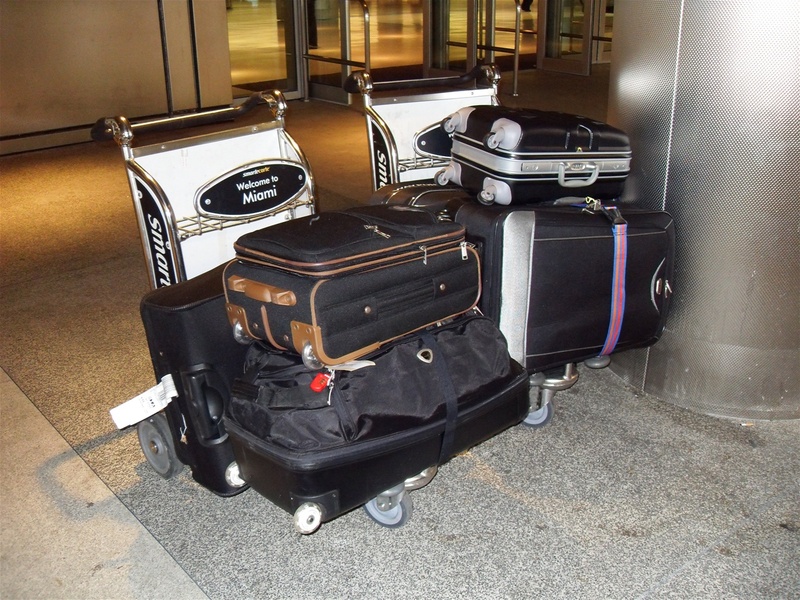 Because of the way we had been treated by officials at both the American Embassy and Immigration on our arrivals here, I'm not sure that I want to ever return to America. As I took the long walk back to the main building I was sure that one day I would return to motorhoming. We ran out of LPG last night therefore we had no heating, so it was a pretty cold night, and we didn’t want to get out of bed to dash to the shower block either. Once we’d plucked up the courage it was worth it as the showers here are terrific. Today was a very busy day. We had so much to do sorting out all the cupboards, making an inventory of everything we were leaving, packing and washing down the outside of the vehicle. We also waved goodbye to our neighbour, Andy Crawford and his wife who were making their way to Wichita Falls for a Thanksgiving celebration with their family, and who had kindly invited us along if we wanted to join them, even offering to pick us up and drop us back here again. 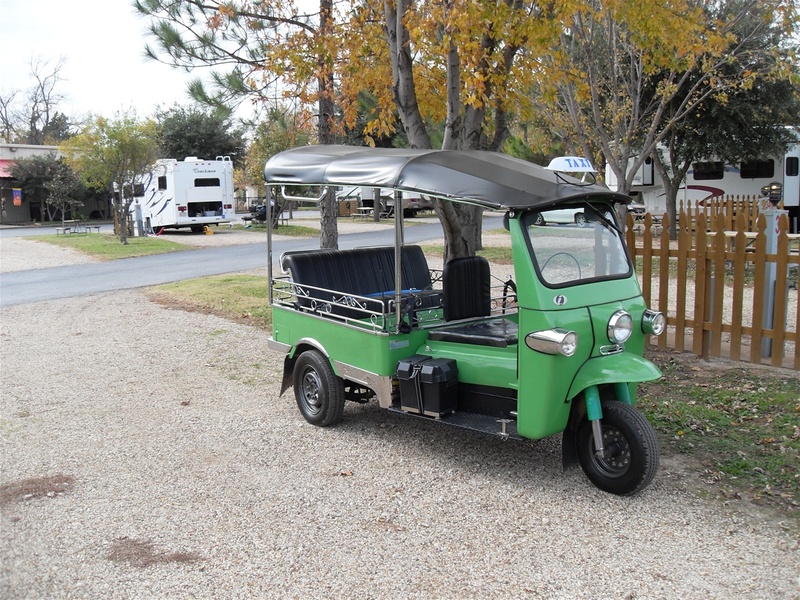 I took a couple of photographs of a Tuc-Tuc, one of two towed on a trailer behind an RV by a chap who’s bought them here for testing by the Texas state authorities. He and his son have bought the importation rights for these vehicles in the USA www.tuktukusainc.com and they’re looking to get them tested and approved for use in every state except California where due to strict legislation it just isn’t worth the hassle. So keep an eye out for the success of these vehicles in the USA – you heard it here first! Before the office closed we reluctantly bought some more LPG so that we’d be warm tonight plus she’d have some onboard during her storage and likely sale. If I’d known we were going to have to finish up buying some I’d have bought it much sooner and enjoyed the benefit on those recent very cold nights. What there has been of the evening has been spent watching TV and typing up the inventory. 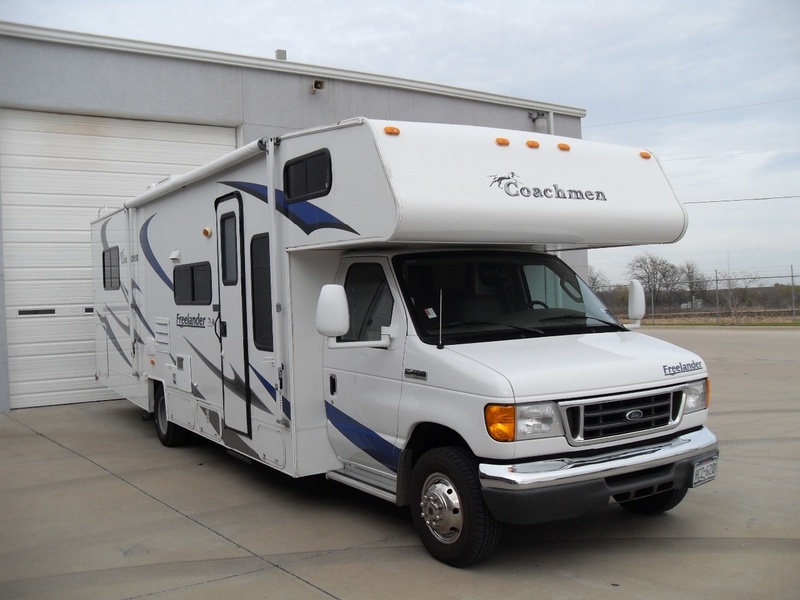 We have to be off the campground by 12:00 tomorrow and so we’ll have some time to finish the outstanding jobs before delivering the RV to Motor Home Specialists and catching a cab to a hotel near DFW airport. LOCATION TONIGHT: RV Ranch, 2301 S Burleson Blvd, Burleson, Texas 76028. This morning we made our way down the road to see Kelly at Motorhome Specialists. I told him what we had in mind and he was happy to accommodate us and so we went up to the office to discuss the storage and possible sale by consignment with Steve. We agreed to bring the RV to them Wednesday afternoon. I felt happier after that was out of the way, and then started to work our way through other jobs on our list, including the cancellation of our P.O. Box at Burleson Post Office, buying some odd bits from Camping World, getting a quote for shipping our 30 souvenir mugs home from UPS ($400!) and close our current account with Bank of America. That done we returned to the RV Ranch campground and hooked back up again. I made a start on packing my larger suitcase with items that I wouldn’t need until we got home, I’m trying to gauge as soon as possible if we can fit the souvenir mugs in to one of our 4 cases, normally there wouldn’t be room but I’m ditching quite a lot of stuff this time rather than take up valuable space on the journey back. I got chatting to Andy, one of our neighbours who’s a nurse anesthetist. He drives around in a lovely Class ‘A’ diesel pusher. He was telling me he’s considering getting something smaller like ours, I stood there thinking ‘I’ll swap you’. He and his wife even came across later to ask us what we were doing for Thanksgiving. He and his family are having a get together at Wichita Falls and we were invited, he’d even get us picked up and dropped back. We thanked him for his very kind offer and explained that we’d already booked to be in a hotel near DFW airport that day. His attitude was typical of all that is good about folk over here, especially I think, Texans and those on the West side. This evenings meal was another fry-up, just as enjoyable as last nights, the reason being we’re down to the last of our food now and have to make do with what we’ve got in. This evening is being spent watching TV and making lists of remaining ‘just’ jobs. Tomorrow is our one last clear day to prepare ourselves and the RV and there’s still quite a lot to do. That was another cold night, though not as bad as the previous one. I’d also forgotten just how many noisy railroad trains pass through here during the night. Never mind, this would be our last night in a Wal-Mart car park. After getting ready we vented the RV for the last time whilst out on the road. Every morning without fail we change the air inside the RV, opening roof vents and doors and turning on fans. At about 09:30 we set off for Alvarado near Fort Worth, a trip of about 250 miles. Before leaving we topped the tank up paying the least ever at $1.65 a gallon, less than half what we were paying on the last trip, which is just as well since the deteriorating exchange rate has added 25% to our costs. We decided as we approached the area that we’d go and see the folk at Motorhome Specialists www.mhsrv.com first thing tomorrow morning rather than bother them at the end of a busy day. We’ve booked in to the RV Ranch campground www.rv-ranch.com again which is where our last trip ended and this one began. We’re here for three nights before handing the vehicle over for storage or sale. The time will be spent packing cleaning etc. We would like to have handed it over on Thursday but that’s Thanksgiving Day and they’ll be shut so we’ll be making for a hotel having handed it over on Wednesday.